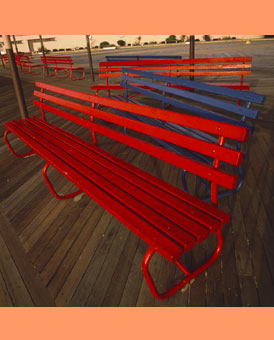 Red and blue benches at Ocean Beach in New London have filled the boardwalk as long as I can remember, even back to the 60s, my wife says, when she went there with her senior class. In those days, the beaches were filled, and the boardwalk was filled, with every third person eating a corndog or clam fritter. Sandy bathing suits, sun burns, and blue jars of cold noxema. That’s what I remember most about Ocean Beach.